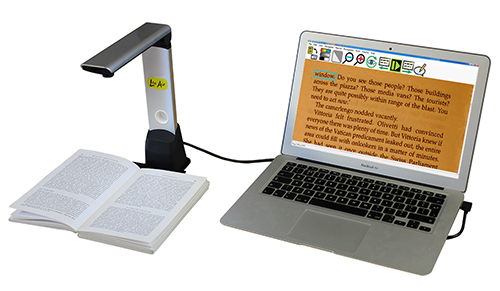 Magnify, read, re-format, import (virtually any electronic document), export, save, bookmark... your perfect dyslexia companion! Lex software & Lex Air Camera. Lex Air is designed to be used in conjunction with the Lex software. It is a highly portable camera system that gives dyslexic users near instant access to practically any physical document. Weighing just 500 grams (1.1 lbs) it is the ideal portable solution for computer users of all ability levels. Simply place your document under the camera, press Enter on your keyboard and a few seconds later, your document is being read aloud to you, in your chosen visualisation, text size, colour and formatting. Reading couldn't be easier! Who is Lex Air for? Lex Air is for any dyslexic computer user, who wants near instant, easy and accurate access to printed documents. It has been specifically designed for the requirements of dyslexic students, business professionals and anyone on the move with a laptop PC. You need to read physical documents such as text books, letters, invoices, etc and are looking for something light weight and portable to enable you to read your documents more easily. You are tired of using flatbed scanners which take a long time and require spines of books to be broken or ripped open in order to accurately scan them. What are Lex Air's benefits? Fast mutli-page capture: up to 20 pages per minute capture with advanced motion detection algorithms mean you can acquire and store entire text books or long documents in minutes, not hours. Once they're captured, you never need to carry them with you again. Time to read: modern PCs will allow you to capture and begin reading a page of your document in just two seconds. Incredible accuracy: Lex Air uses a high resolution camera which recognises down to 6pt text. It has a superb depth of field allowing even the thickest of books to be captured with ease. Breaking the spines of books to scan them is a thing of the past! Glossy document capture: Some camera systems have difficulty with glossy documents but this is not the case for the Lex Air! Although it has integrated lighting, the camera and software have been optimised to capture without the lights being required, meaning even glossy magazines can be captured without difficulty. Fastest Set Up time: Lex Air has been specifically designed to be as fast to set up and take down as possible - it takes less than 5 seconds. Just unfold it, plug in one USB connector into your laptop or PC and you're ready! Nothing to screw in or plug together. 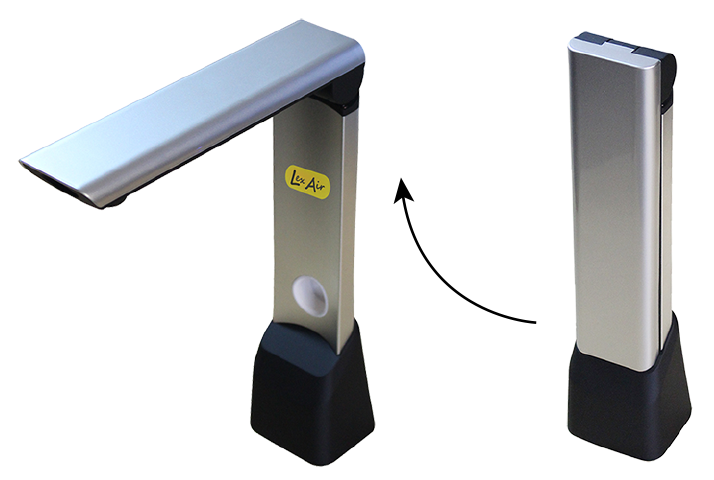 No Batteries: All Lex Air needs is one USB 2.0 port - no need to worry about keeping a separate battery charged. Stylish and practical design: A stylish, discreet and light weight design ensures that Lex Air is ideal to use in nearly any location. Footprint: Occupying just 65mm x 62mm of table area, Lex Air takes up very little space. Weight: Lex weighs just 500 grams (1.1 lbs) making it easy to take with you wherever you go. Versatility: Read almost any surface, flat or round. Lex Air's camera allows it to capture deep into the spines of books without flattening them, as well as read 3D objects like tins. Lex Air is designed to be as fast and simple to set up and pack away as possible. Just lift the camera head up until it stops and plug in the integrated USB cable into your computer. To pack away, just do the same in reverse! It takes just 5 seconds. In order to make Lex Air as fast to set up and pack away as possible, it ships with an integrated right angled USB cable which is safe to be left plugged in to Lex Air at all times. This means you only need to connect one end to your computer when you wish to use it. Lex Air's high resolution camera allows text down to 6pt in size to be accurately captured and recognised. This is extremely small text which is 25 to 30 percent smaller than newspaper print. Lex Air has a very large depth of field (over 8cms). This means that even the thickest of books can be accurately captured, right into the spines. This is key difference when comparing it to a flatbed scanner where books often have to have their spines destroyed in order for them to be flat enough to be accurately scanned. 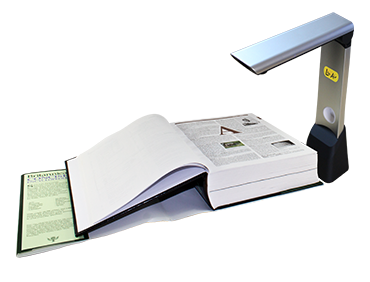 Lex Air's advanced camera allows extremely thick books to be photographed and read accurately, without the need to flatten them, damaging their spines. Focus Depth: 10 cm (4"